Wells Fargo Hit With $1 Billion In Fines Over Home And Auto Loan Abuses : The Two-Way Some consumers were charged too much to extend the lock on their mortgage interest rates, and the bank's mandatory insurance program added unneeded costs and fees to borrowers' auto loans. The Consumer Financial Protection Bureau is levying a $1 billion fine against Wells Fargo as punishment for the banking giant's actions in its mortgage and auto loan businesses. The Consumer Financial Protection Bureau is levying a $1 billion fine against Wells Fargo — a record for the agency — as punishment for the banking giant's actions in its mortgage and auto loan businesses. Wells Fargo's "conduct caused and was likely to cause substantial injury to consumers," the agency said in its filings about the bank. Wells Fargo broke the law by charging some consumers too much over mortgage interest rate-lock extensions and by running a mandatory insurance program that added insurance costs and fees into some borrowers' auto loans, the CFPB said. The CFPB said Friday that the penalty is part of a settlement with Wells Fargo, which has pledged to repair the financial harm to consumers. Because of the penalties, Wells Fargo says, it is adjusting its preliminary financial results for the first quarter of 2018, shifting $800 million in its balance sheet — and dropping its net income for the quarter to $4.7 billion. The new federal action against the bank comes less than two years after Wells Fargo was fined $185 million over what the CFPB called "the widespread illegal practice of secretly opening unauthorized deposit and credit card accounts." Those earlier penalties included a $100 million fine by the CFPB — a record at the time. The new punishment stems from the agency's findings that Wells Fargo abused its relationship with home and auto loan borrowers. Wells Fargo was also punished by the U.S. Office of the Comptroller of the Currency over its risk management practices, with the agency collecting a $500 million penalty as part of the fines announced Friday. Along with treating its customers unfairly, the OCC said, Wells Fargo had failed to maintain a compliance risk management program that was appropriate for a bank of its size and complexity. 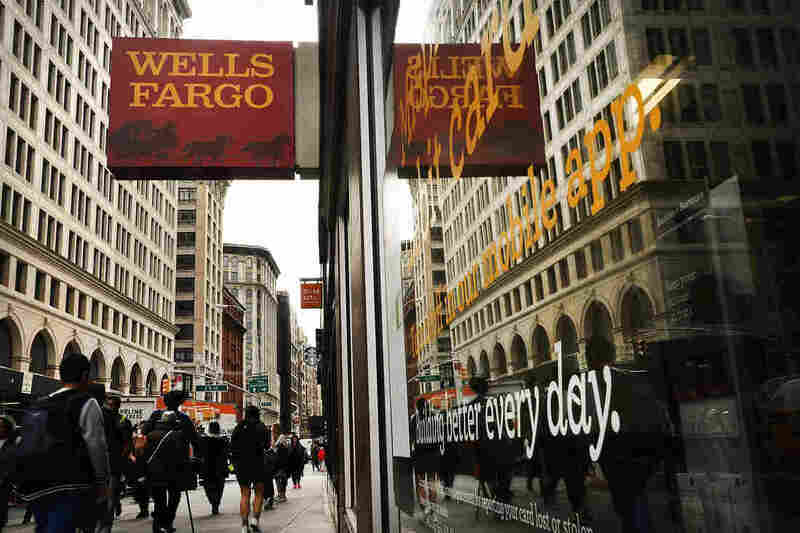 That failure, the OCC said, led Wells Fargo to "engage in reckless unsafe or unsound practices and violations of law." Problems in the way the Wells Fargo auto loan unit handled consumers' accounts exposed people to hundreds or thousands of dollars in premiums and fees. The issues were also found to have possibly contributed to thousands of cars being repossessed. The CFPB said problems with the auto loan unit persisted for more than 10 years, from October 2005 to September 2016. Lenders can require borrowers to maintain insurance on their vehicles — and if a borrower doesn't do that, there is a process that allows lenders to arrange for what is called force-placed insurance and add that cost to the loan. But Wells Fargo acknowledged that of the roughly 2 million car loans that it put into that program, it "forcibly placed duplicative or unnecessary insurance on hundreds of thousands of those borrowers' vehicles." For some borrowers, the bank also improperly maintained those force-placed policies on their accounts even after they secured adequate insurance. According to the CFPB, "if borrowers failed to pay the amounts [Wells Fargo] charged them for the Force-Placed Insurance, they faced additional fees and, in some instances, experienced delinquency, loan default, and even repossession." In one five-year period from 2011 to 2016, Wells Fargo acknowledged in the settlement, the extra costs of force-placed insurance may have played a role in at least 27,000 customers having their vehicles repossessed. Wells Fargo failed to follow its own policies in how it charged fees over locking in mortgage interest rates beyond the standard guaranteed window, the CFPB said, adding that the bank charged customers for the rate extension — even in cases in which the bank itself was the reason for delays in closing on a home loan. The problems persisted for several years after the bank's internal audit identified the risk of harming consumers, according to the government's filing about the settlement. Wells Fargo unfairly and inconsistently applied its policy on rate-extension fees from September 2013 through February 2017, the agency said. In February, Wells Fargo also faced a government reprimand in February, when the Federal Reserve took the rare step of "restricting Wells Fargo's growth and demanding the replacement of four board members in response to 'widespread consumer abuses and compliance breakdowns' at the bank," as NPR reported. At the time, the Fed faulted Wells Fargo for maintaining a business strategy that prioritizes its own growth at the expense of risk management.